Love it! Effortlessly chic. Love the shoes and the pairing with the stripes and the dots. So cute! Your look is so cute in this post! 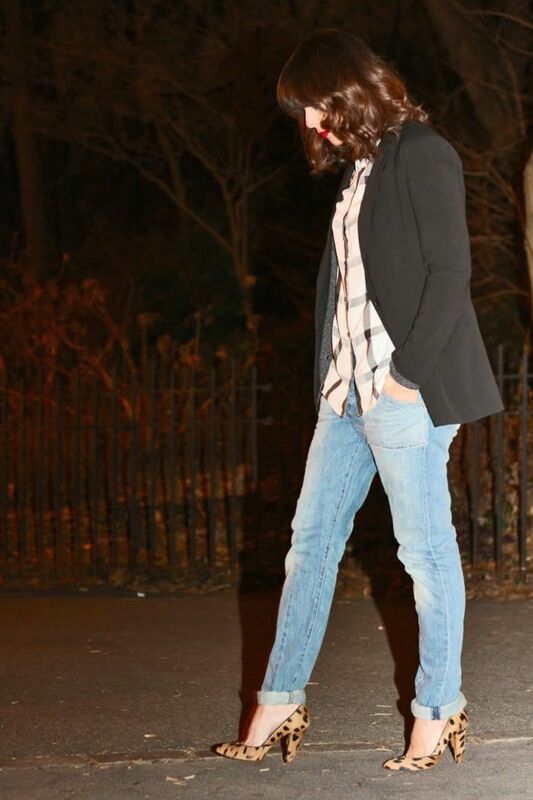 love the feminine boyfriend look! super cute !! OMG you are so pretty. I love red lipstick on you. This outfit is genius, love the mix of formal and casual elements. Sounds like a great time! Love the pumps and your long blazer. Really nice mix of patterns ! You look great ! great outfit ;-) I love your nails ! Your jean is great ! love the details, and the way you wear the jeans. you look amazing. Your nails look cute. Love your blog! Love your shoes and of course, like always, your lipstick. what a beautiful outfit, i love this trousers ! I love seeing this plaid mixed with animal print. Very pretty Delmy. you look gorgoeus! Red lips really flatter you! I love this post...Do the Madewell Pumps run small or true-to-size? Very cute outfit! Love your nails. Love the whole outfit! It reminds me of a Weekend with the beau and waking up early for coffee! Plus your nails are phenom! I love those polka dot nails! I love the nails! great and nice outfit :D! Love if you follow me back! Classic and chic as always! !